More long-form, pad-driven quiet time from Another Neglected Hobby, aka Mark Cotton, in a two-track, hour-long release. 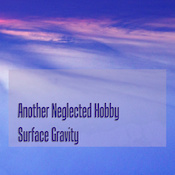 Reminiscent of ambient path makers like Roach’s Quiet Music, Surface Gravity is not an album you need to listen to closely. Cotton doesn’t go out of his way to change up the rise-and-fall mode of the style, and the work doesn’t feel deeply layered. It is, however, warm and quiet, and takes a lot of its strength from its effect rather than its sound. Having let it loop for quite some time, I can vouch for its calming capabilities and non-obstrusive nature. Having let it loop for quite some time, I can also say that while it’s a nice enough ambient ride, there were times when I wanted something a bit more out of it. A stronger shift, a darkening maybe, a fresh dynamic, something. I’m okay with the work here, but it feels—particularly compared to Cotton’s previous works I’ve reviewed—like more of an ambient exercise than a focused outing. A good effort that just falls a touch flat. Check it out at the link below and draw your own conclusions.